It does not require much distracted gardening before weeds can take over. If your garden weeds are claiming victory and you can't find the plants you want growing in the garden, your growing area may be an overgrown mess. Take back your growing space and clear an overgrown garden with some diligent effort and hard work. After you clear the area and have a fresh garden again, your results will be well worth the labor. Transform your weeds into a work of art. Attack the garden area in early summer, for best results. 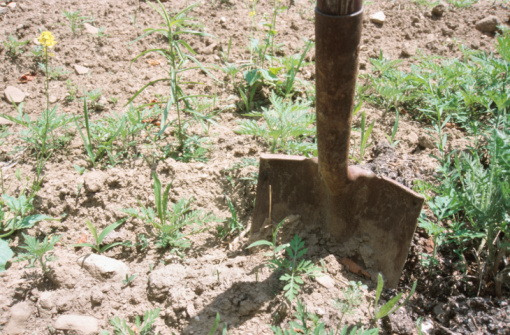 Use the garden spade or the hoe to loosen and remove all of the weeds growing in the area. Pull the tendrils and foliage out of the soil and discard everything into the trashcan. Use the rototiller to cultivate the soil down to a depth of about 8 inches. The weed pulling and cultivating you just accomplished probably dislodged many seed spores living in the soil. The best way to fight these seed spores is to wake them up completely with the rototiller. Work the entire garden area with the rototiller to cultivate the soil. Rake the soil smooth. Cover the soil with the clear plastic and secure the edges of the plastic over the soil tightly with bricks or rocks. Leave the plastic in place for at least eight weeks but preferably throughout the autumn and winter. During this time, the sun and warm temperatures will kill weed spores in the soil. Remove the plastic cover in the spring. Test the soil to see if it is dry enough to work. Scoop up a handful and form it into a ball in your hand. Touch the soil ball lightly with your finger. If the soil breaks apart at your gentle touch, the soil is ready to cultivate. If the soil holds its shape, wait another week and then test it again. Rototill the soil in early spring when the soil is dry enough to work. Cultivate the soil down to a depth of about 6 to 8 inches to prepare it for planting. Rake the soil smooth again. Add about 4 inches of compost over the soil and spread it evenly with the rake. Leave the area unplanted for about three weeks while the compost and soil intermingle. Rototill the garden one more time immediately before planting.